Learn bronchoscopy from the comfort and safety of your own home or office. Become familiar with the anatomy of the trachea and bronchi as seen through the flexible fiberoptic bronchoscope without having ever performed the procedure on a patient! iBronch will help any student, resident, or practicing physician at any level learn about bronchoscopy. 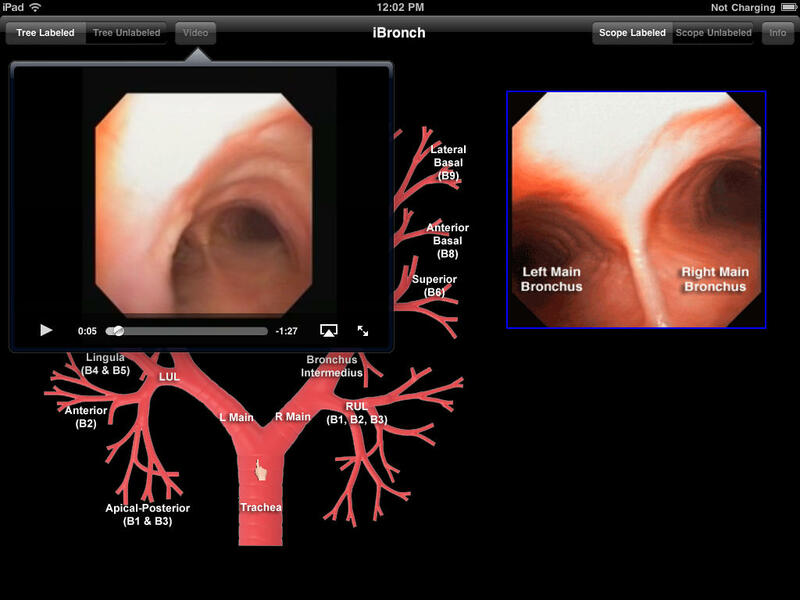 iBronch uses actual recorded fiberoptic bronchoscopy images viewed by using your finger as a “virtual bronchoscope” by moving along a schematic of the human trachea and bronchi. Bronchoscopy is a technique to visualize the inside of the airways for diagnosis and treatment. The bronchoscope is a bundle of fiberoptic strands which allows physicians to determine abnormal anatomy and to check for foreign bodies or tumors within the tracheobronchial tree. Are You Smarter Than Your Attending?